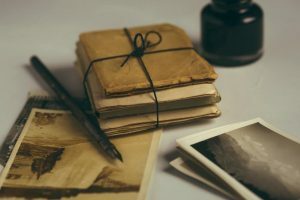 Old letters are special because they provide insight into the thoughts, worries, and dreams of your relatives and ancestors. Family historians who inherit a batch of old letters need to be careful with them. Learn how to preserve those old letters – so they will be around for future generations to enjoy. The oils on your hands can cause damage to old, fragile, paper. The oils from your fingers can discolor the places on the letter where you held it or touched it. Take the time to wash your hands, and dry them well, before touching old letters. There are several ways to safely make a digital copy of the old letters. Place the letter flat on a table in a well-lit space. Use your smartphone to take a photo (or several photos) of the letter. It won’t be difficult to move those photos from your smartphone to your blog or favorite social media website. Another option is to use a wand scanner to make a digital copy of the old letters. Go very slowly, try not to press too hard on the letter as you scan. This method is best for letters that are sturdy and not very old. Today, if we want to communicate with a loved one, we do it by sending a text, or an email, or with a comment or private message on social media. Years ago, people used pens to write letters on paper – and many of them used cursive writing. Over the years, that writing may have become blurred. Your relative’s handwriting might be impeccably neat, or it could be near illegible. As time goes on, fewer and fewer people will be able to read cursive writing. Take the time to type out a transcription of what the old letter says. Doing so will make it accessible for people who can’t read cursive. It makes it much easier to see what your relative actually wrote. The typed out transcription is perfect for referring back to when you want to re-read the old letter. Carefully unfold the old letter and lay it flat. Handle the paper very carefully and move slowly. You don’t want to accidentally cause the letter to rip. When you are ready to store the letter, place it inside an acid-free folder. Archival Products sells acid-free boxes, document cases, file folders, and more.